NBC today announced an update for its Android and iOS television-viewing apps that brings live streaming to select areas of the country along with a small but robust catalog of the network's classic series offerings (via Engadget). 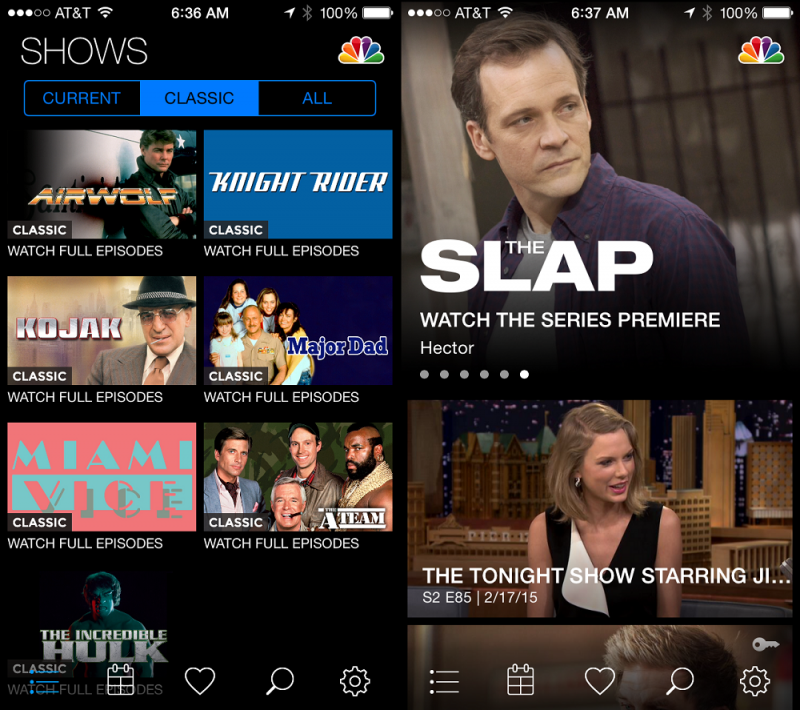 Following in the footsteps of the Watch ABC app that introduced to users the ability to live stream the channel on their mobile device, NBC's new update brings a similar function to their app, with a few hindrances. Like ABC's app, the live streaming functionality is available only in areas where the network owns the local station, meaning some areas may not be able to fully take advantage of the new live streaming feature at all. This is in addition to the usual cable or satellite provider subscription account needed to access normal streaming functionality, as well. * Live video stream of NBC programming available for cable/satellite subscribers in select markets. * Expanded full-episode library of classic NBC shows available, including The A-Team, Miami Vice, Kojak, Battlestar Galactica, The Incredible Hulk, Knight Rider and more! On the other side of the update, NBC is bringing back a handful of classic series - from Airwolf to Miami Vice and The Incredible Hulk - with full episodes and seasons available right next to their modern line-up. Unlike the current shows, these throwback episodes don't require a satellite or cable subscription log-in to watch, so arguably anyone could download the free app and check them out. NBC [Direct Link] can be downloaded from the App Store for free. I am among the "cable cutters" and don't have a cable or satellite provider. At least I can watch the A-Team. I too am a cable cutter and it irks me to the max that these guys still require a cable subscription. They are totally clueless. Its the same as when I use Apple Pay at a store and then they ask for an ID and print out a reciept that I need to sign. CLUELESS. Hopefully they will catch up. Until then they continue to lose potential audiences becasue they refuse to support cable cutters. Oh well their loss, not mine as I have many other options. That's a nice update but they still can't update it so it's optimized for the iPhone 6 and 6 Plus? Watching Kojak for free would be worth it. Also a cable cutter who wants A La carte. Sling TV looks like closest possibility. I'm guessing these will not Airplay to an Apple TV? Actually looks okay airplay'ing to my Apple TV. well, I was thinking if they didn't do a good job on the analog to digital transfer and not caring about 25-35+ year old shows.